This is one position within the backstroke stroke cycle. 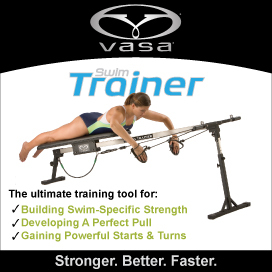 The MONA software package includes front, side, top, and bottom views of optimal swimming technique for all four strokes – butterfly, backstroke, breaststroke, and freestyle. The multimedia control allows you to step through the video images frame by frame or play at normal swimming speed. At each position within the stroke cycle there are cues to speed up the learning process. MONA is based on the principles of physics, published research on the biomechanics of swimming, and over 20 years of documented findings from Aquanex. MONA is the optimal model of technique because she has all the best features with none of the limitations. MONA is available at the STR online STORE.